Every fancy restaurant should have a cafe/tearoom offshoot, it's a brilliant idea! Especially when an afternoon meeting near Gramercy Park led us to the Tamarind's Tea Room, where we picked up the saag paneer and lamb sholley sandwiches to go. Wraps had their heyday and we generally refrain from ordering them, but mostly because you can never be sure that the wrap itself will be good. 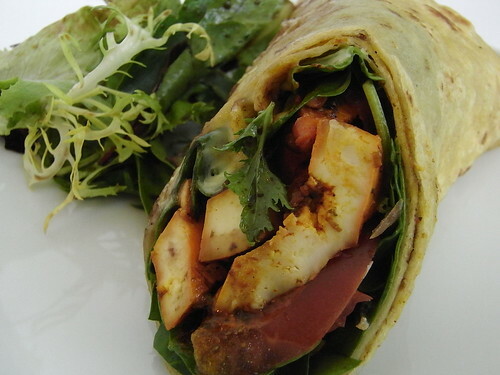 Luckily we didn't know that a "sandwich" at Tamarind actually meant "wrap". Even more luckily the wraps were actually paratha bread, neatly containing some pretty tasty ingredients. I love sandwiches. It is freakin awesome.